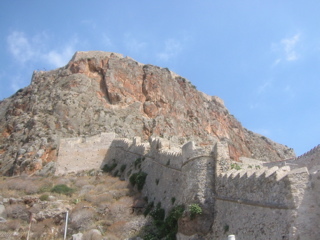 We spent a day at the hilltop fortress town of Monemvassia. As we approached across the relatively flat coastal area, we were captivated by the sight of the enormous rock on which the town is built. Its scale wasn't clear until we arrived at its base, pictured at left. We reached the bottom of the town's walls by riding a tiny shuttle bus packed with locals up a steep road on the side of the rock, which is surrounded by water except for a small road. It's hard to imagine how anyone could even have considered storming these walls. We spent a great day there, starting with a hike to the very top of the rock, above the town. The sun streamed down on the scrubby vegetation around us as we explored the ruins there. We could see for miles. As we looked down on the water below, we saw an enormous yacht. It was fun to imagine what it must be like to ride such a beautiful vessel. 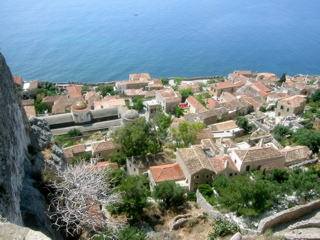 As we climbed down, we took in the view of Monemvassia below. We had built up quite an appetite. We scouted out a little restaurant overlooking the water from a great height and spent three hours enjoying amazing conversation with our new friends while we ate yet another delicous meal. One of the high points of the day was swimming in the Aegean Sea below Monemvassia. After our meal, we strolled down tiny passages until we found ourself at the water. 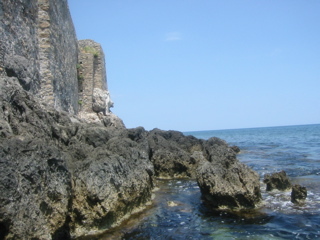 There was a small swimming platform that extended past the rocks at right. The water was warm, calm, and beautifully blue.